To secure a spot please send me an email via the contact form of my website. There is a limit of 12 spots, with bookings essential. During the workshop we will cover works on paper using a variety of mediums such as; pencil, watercolour, gouache & acrylic paints. In addition to us all drawing together, I will also delve into my 15 year experience as an illustrator giving an insight into the commercial side of illustration, from creating hand-drawn animated film clips to working for children’s theatre, amongst numerous other topics. I would also like to take this opportunity to extend my sincere gratitude to Eckersley’s, The Barossa Valley Cheese Company & Turkey Flat Vineyards who have graciously sponsored this event, to make sure we draw, eat & drink at our best! 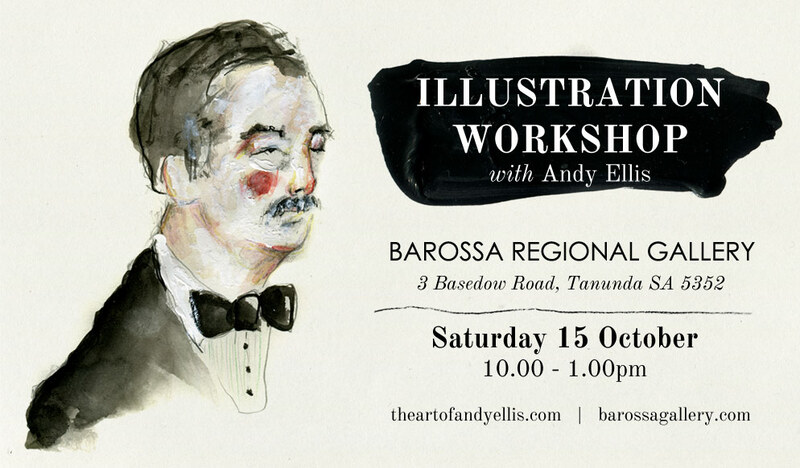 All art materials are provided, which I have sourced from Eckersley’s, cheese from The Barossa Valley Cheese Company will also be on offer, as well as wine from Turkey Flat Vineyards by way of their delicious 2015 Barossa Valley White in which, coincidentally (or not) I just so happened to create the label illustration for. Three of my favourite businesses in their respective fields.